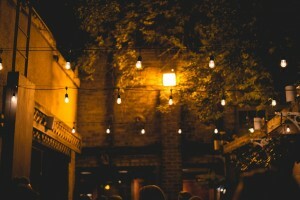 It’s tough to beat summer in Winnipeg and one of my favorite things to do is enjoy dinner and drinks at an outdoor patio in the warm night air, under the clear night sky, and (hopefully) under some amazing cafe lighting. Black Rabbit Bistro in Winnipeg’s Osborne Village neighborhood is one of those spots. 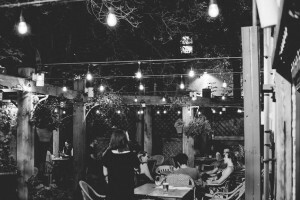 At the old Basil’s location, they already had one of the most beautiful patios in Winnipeg complete with European-style overhead trellis, vines, and flowers. 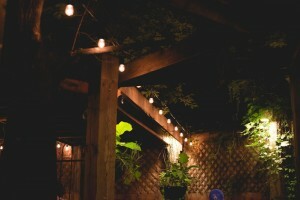 We recently worked with them to add cafe lights to help make the atmosphere just as amazing at night as during the day. Incandescent, suspended lights (also known as festoon lights) were the preferred lights for Black Rabbit and we customized the lengths to fit the patio exactly, creating a clean, professional look. To keep the lights perfectly straight, we attached the socket wire t0 a thin aircraft cable which will help this look sharp on a permanent basis. I enjoy the classic look of the incandescent bulbs and the fact that they are hung low – but not “too low” – matching the height of the wooden trellis. 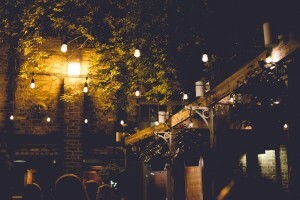 Below are a few pictures as I thought you might enjoy them as much as I do – but you should definitely drop by yourself. 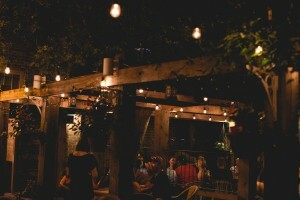 This is a great restaurant and one of the best patios in Winnipeg.